Ice Climber (アイスクライマー, Aisu Kuraimā) is a vertical platformer developed and published by Nintendo. Originally released for the Nintendo Entertainment System in 1985, the game has since been ported to many of Nintendo's major platforms. 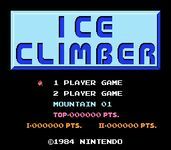 In Ice Climber, the characters Popo (ポポ) and Nana (ナナ), collectively known as the Ice Climbers, venture up 32 ice-covered mountains to recover stolen vegetables from a giant condor. Source: Wikipedia, "Ice Climber," available under the CC-BY-SA License.